Google has released mobile version of its Calendar. 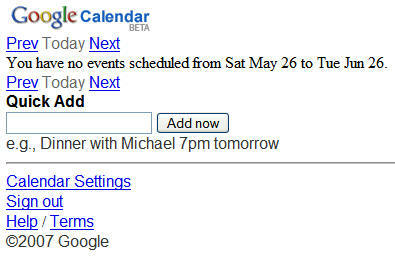 Google Calendar is quite popular for being feature-rich and still maintaining its simplicity. You will need to visit calendar.google.com from your mobile phone, and you can plan your day-events using Google Calendar. We realize that more people in the world have mobile phones than have computers, and people take their cell phones with them everywhere. Since one of our main goals on the Calendar team is to make planning your events and maintaining your schedule as easy as possible, starting today, you can access your Google Calendar account from your cell phone!